When times are tough – whether it’s poor sales, customer complaints or staffing issues – businesses may find little comfort in knowing they’re not alone. But that’s often because they’re still struggling with problems in isolation, rather than learning from their peers in non-competitive firms. That, in a nutshell, helps explain the “Circles of Success” concept we’re bringing to the Salesforce World Tour, which touches down in Toronto on May 14. Although the agenda is filled with keynotes from Salesforce experts and special guests, attendees will have just as many opportunities to talk and share their stories as they will to listen to great business advice. Spread throughout the day in the event’s breakout sessions, the Circles of Success are moderated discussions with other businesses who are seeking to grow, improve their processes and make their customers happy. Getting the first customer is tough, and building a stable of loyal, repeat business is even tougher. In fact, small and medium-sized businesses can be so busy selling that it becomes difficult to keep track of what’s working and what’s not. Cloud-based software makes that easier of course, but listen for the data points that your peers determined contributed directly to greater sales. What information did they collect? How much data provided useful analysis? What was the process of turning the insight into action? These are all questions to ask, sharing your own experiences as appropriate. Part of the power of CRM is being able to know more about your customers than was ever possible before. How are other companies making use of that capability? For example, what has made the difference between a one-off sale and a lifetime customer? How do you calculate the time and money you spend to build deeper relationships with your top customers vs. new prospects? What does true customer satisfaction look like? Also, think about the things which don’t always seem tangible like the morale of our staff. Many firms approach these things very differently. Pick and choose what works for you. When technology fails, the first thing experts suggest doing is turning something off, then trying again. Businesses often have to do something similar. One of the best icebreakers for a Circle of Success-style gathering is, “Tell us about the last time you started over on a strategy, a process or a product?” No one likes to talk about their failures, of course, but the smartest people in business understand that assessing the lessoned learned from their challenges – and then passing them on – is an important part of being a leader. Small and medium-sized businesses get used to doing things the same way, just like big businesses do. When the demands of customers require a shift in processes or tools – like moving to cloud computing or communicating through social tools, for instance – the big job may be shifting the organizational culture. Circles of Success can be a place to talk about how to effectively work with teams in difficult situations – or at least deepen your understanding about the potential mistakes to avoid. Circles of Success are not the only reason to come to the Salesforce World Tour Toronto. Salesforce is bringing the action, excitement, education, and big announcements of Dreamforce to the Allstream Centre in Toronto for free! 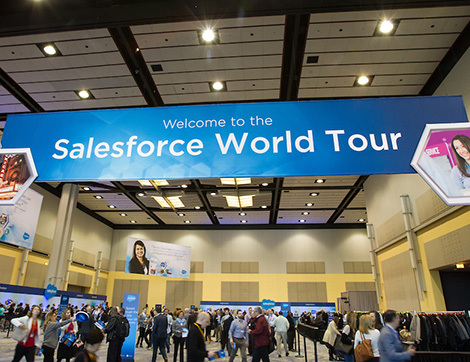 Experience the Salesforce World Tour in Toronto on Thursday, May 14 and see how to connect with your customers in a whole new way. Register today for a full day of innovation and learning.